Is it to copy the Apple Watch or because no one normal wants one? Samsung made a slightly unusual announcement as part of the media fallout surrounding Mobile World Congress last week, with one of its mobile division bosses revealing that it's going to "pause" its strategy of releasing a never ending flood of smartwatches. The official reason for this move is that it's made loads of smartwatches already and wants to spend time, ahem, perfecting the genre, as if its previous efforts are pretty much there and nearly bang-on, instead of scattergun attempts to see if anyone likes anything it can make small enough to wear. Unofficially, of course, this comment was taken to mean everything from "smartwatches are over" to "Apple has already won the war without releasing a thing" by the masses online, who both commended and mocked Samsung's decision to take a break from bashing out smartwatches in equal measure. Actually, no, it wasn't in equal measure. It was more like 99% people calling Samsung "Shame-sung" and saying it's a rubbish company built on nicking ideas, and 1% people calling Samsung "Sham-dung" and saying it's a rubbish company built on nicking ideas. Over on BGR, which led its readers down a certain path by saying the company was effectively "clueless" about what to do in the wearables world, commentary was quite... abrasive from the off. The one upmanship descended into a search for the haver-of-the-ultimate-original-idea, with readers listing who copied what from who first in an attempt to prove... nothing. Reader Androidmalware suggests the reason Samsung's pausing smartwatch development is so it can get an Apple Watch in to clone, posting: "Samsung Gear has been a complete joke and another failed attempt by Samsung to be first or relevant. They are waiting for the Apple Watch to release so they can copy that too." In reply, John Kar thinks Apple's had its day and Apple Watch is little more than Apple doing the cloning of the competition, albeit with a nicer bezel, replying with: "It's Apple that might be in trouble, since they don't have any major upgrade to the iPhone line. They added bigger screens, but there's not much else to add, and Apple isn't smart enough to engineer curved screens, so I doubt Apple can copy that strategy." He continued: "If the iWatch is a testament to anything, it's a testament that Apple lost its touch and that they won't be able to woo people in like it did with the original iPhone and the iPhone 6." You can't really say that until it's out. though, John. How many people were equally dismissive of the iPhone before it came out, took off, and became everyone's favourite thing-to-look-at for 16 hours a day in a matter of a couple of years? Androidmalware then shamed himself with the response "Fandroid douchebag" after some back and forth banter. The most typical reaction message was provided by Mobile Syrup reader Tisdale, who popped out the predictable response: "AKA 'we want to wait until Apple launches theirs and then we will copy it and pretend its better'." To which commenter Unorthodox replied: "Is [Samsung mobile boss] Young-hee Lee like 4 years old? As if no one understands what he meant to hide between the lines. It's sad that such a vendor leads Android handset sales volume." But reader Marc Palumbo is down with Samsung's message, even though he doesn't appear to be that much of a fan of the company in general, offering: "As much as I despise Shamesung, I actually like their smartwatch. It really looks nice and they look like their smartphones. 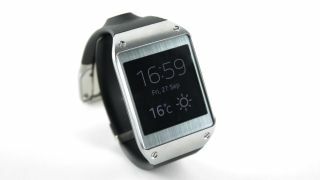 Unlike the other watches out there, this looks like it compliments the phones nicely." A couple of messages down, Samsung was also called "Sham-sing". People love their jokey insults.